The Single Leg Amputee Sports Association (SLASA) was founded in 2001 at the end of the decade long civil war in Sierra Leone. SLASA runs a football-based programme for amputees with regular training sessions and physiotherapy. The programme offers its players opportunities for participation in local and international tournaments. SLASA currently has members across the country who are supported in the areas of education, health, micro-enterprises and advocacy. SLASA provides trauma recovery, promotes peace, addresses the misconception of disability being an inability, and helps amputees reintegrate into society. There are currently six football teams throughout the country that participate in the national Amputee Football League, and the national team takes part in various international tournaments. The game is played with 7 players a side and crutches.More information about the sport can be found on the www.Facebook.com/SingleLegAmputeeSportClub. 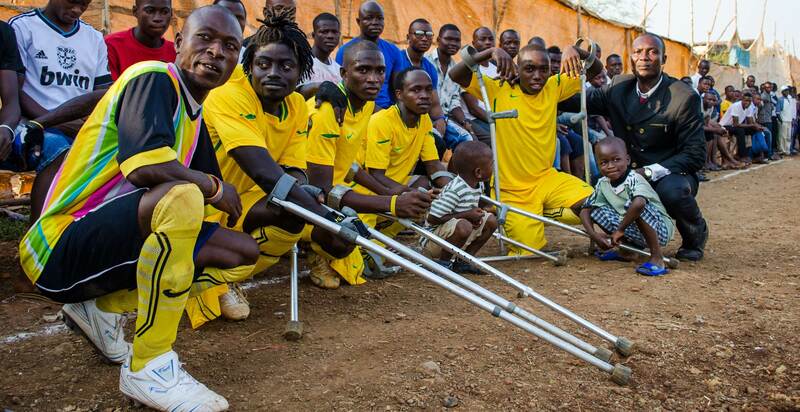 Amputees are legacy of the civil war in Sierra Leone. Be a helping hand to amputees. God bless you all. We amputees are changing our own destiny. We have replace war for peace. We have become symbol of the new era in the country. Festivall16 in Lyon city left unforgettable memories. But our heart and prayers for protection of the French people and innocent immigrants under attacked by wicked people. A customize standard pitch for amputee football and multi complex facility is underway in Freetown. The project is implemented by the "Single Leg Amputee Sports Association - SLASA". The involvement and supports from our partners and friends are highly needed to enhance our successful completion.